Powers/Abilities: The Clansman is a fierce and savage fighter, possessing great strength at a peak human level (allowing him to lift/press up to 800 pounds). He may or may not possess certain mystical abilities which protect him from harm, though being pumped full of bullets at close range was sufficient to kill his human host. The Clansman carries the Sword of Scotia, a six foot claymore (a large, two-edged broadsword) which he wields with deadly skill and force, and is sufficient enough to deflect bullets. The sword must only be used against those who deserve its dire justice, and never against the innocent. Detective Ferguson was trained in armed and unarmed combat and a skilled detective. He occasionally misled his fellow police so that he could slaughter the criminals as the Clansman. Originally, Ian Og was a mighty warrior, skilled with the use of the claymore. Height: (Clansman): 6'4" Weight: (Clansman) 250 lbs. 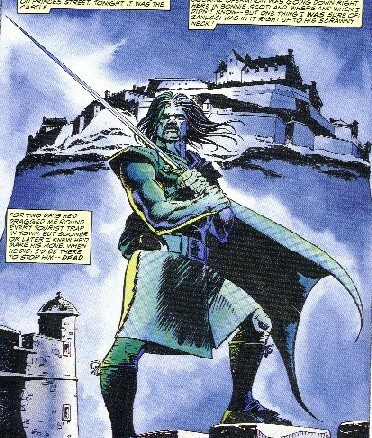 (Marvel Graphic Novel: Punisher: Blood on the Moors [fb]) - In the year 1692, the Clan MacDonald who lived in Glencoe were a rebellious lot, and not great friends of the king. As a lesson to the others of a like mind, the king ordered them put to death. In the wee hours of the morning, men of the cursed Clan Campbell fell upon them without warning...and the blood ran red on the snow. They cut them down--men and women and babes in arms...The MacDonald Clansman, the mighty warrior Ian Og tore into the attackers, but was cut down from a distance by a bullet, then killed by a trio of the Campbells. As he died, Ian Og put a curse on their kith and kin. Red Ian's spirit can never rest! Grant it refuge within this fabled blade! To rise again, when Scotland needs his aid! BTS - The Clansman has been reputed to have come to Scotland's aid in times of aid over the centuries. BTS - In the modern era, Detective Sergeant Ferguson discovered the secret of the Sword of Scotia and took up the blade whenever needed to defend the people of Scotland as the Clansman, possessed and transformed by the spirit of Ian Og. Ferguson, as the Clansman, began waging a one-man war on drug-dealers. 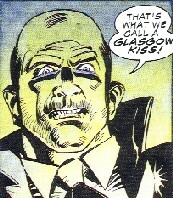 (Marvel Graphic Novel: Punisher: Blood on the Moors) - The Clansman attacked New York drug dealer Bruno Zanussi when he came to Edinburgh on business. He easily cut through Zanussi's men, but before he could kill Zanussi himself, he was knocked aside by the Punisher, who wanted to keep Zanussi alive so he could learn his plans and take out his would-be partners as well. Though the Clansman quickly disarmed Castle, the American vigilante held his own until the Scottish police showed up. Unwilling to use his sword against the innocent, the Clansman left out a castle window, vanishing into the mists. 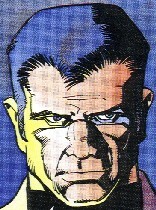 Detective Ferguson and his team investigated the activity of Zanussi, the Clansman, and the Punisher. They confronted the Punisher, but he escaped from them. His squad then learned of the gathering of international drug lords in the Scottish Highlands. The Punisher tracked the drug lords to their meeting place there, in Castle Coe. However, he was captured by the criminals and forced to consume their cocaine filled whiskey--the means by which they planned to smuggle large amounts of cocaine into countries across the world. The drug lords dumped the Punisher into the moors to die, but he was instead found by the Clansman, who took him in and used some ancient herbs to cure him. The Clansman then infiltrated the castle and confronted the drug lords. He fought off their attacks and killed Flurgen and Marat, but the innocent Angus Strathcoe stepped into the way, forcing him to pull back his sword. Angus' son, the criminal Mingus then shot the Clansman full of holes with his uzi. Before collapsing, the Clansman hurled the Sword of Scotia through Mingus' chest, killing him. The Punisher finished off the remaining criminals and returned to the Clansman, who asked him to take the Sword of Scotia to Ailean Munde, and then died, turning back into Ferguson as he did so. Comments: Clansman was created by Alan Grant (writer) and John Wagner (artist). I'd like to see the Clansman show up again. I'd think that only the physical host--Ferguson--was slain, and that the Clansman could possess another someday. I'm not sure if Angus was in the military, but if he was, I'm sure he would have been a Colonel. 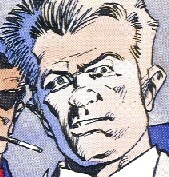 Ferguson's height, weight, and first name were first revealed in the Marvel Knights Encyclopedia (2004). The latter was provided by Kyle Sims; it was done as a reference/homage to the main character of the Highlander television series Duncan McCloud, an immortal that, like the Clansman, hailed from the Scottish Highlands and wielded a sword. Marat's first name was revealed in Marvel Atlas#1. A Scottish crimelord, he was one Bruno Zanussi's connection in Scotland. The Punisher learned of him while trying to track down Zanussi, and confronted him at a football (soccer to those in the USA) game. He fled, but ended up falling into the scoreboard and was electrocuted. A native of Hamburg, Germany, he was the main distributor of illegal drugs for half of Europe; he joined forces with Marat, Strathcoe, Yarkov, and Zanussi in the plot to smuggle cocaine distilled into whiskey into countries across Europe and Russia, and then the whole world. His contribution was to be the extraction process. He fired on the Clansman, and was killed when his bullets ricocheted off of the Sword of Scotia. A native of Marseilles, France, he was the French connection, joining forces with Flurgen, Strathcoe, Yarkov, and Zanussi in the plot to smuggle cocaine distilled into whiskey into countries across Europe and Russia, and then the whole world. He hurled a small dagger (a wee Frenchie knife) at the Clansman, who caught it and threw it back into his eye, killing him. The father of Mingus and grandson of Magnus, he lived in Castle Coe and was present at the gathering of the drug lords. He attempted to use his bagpipes to play a tune to appease the tortured spirits--as the Stratchoes had done every night for centuries, but the drug lords quieted him. When the Clansman arrived, he claimed it was because Strathcoe had not been allowed to properly appease the spirits. He jumped in front of Mingus and caused the Clansman to pause, to avoid hurting an innocent. This pause allowed Mingus to get the drop on him with his uzi. 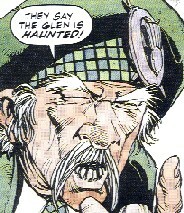 Angus was left a broken man after both his son and his castle were destroyed during the fight with the Punisher and the Clansman. A native of Castle Coe in Scotland, he was the son of Angus, and the great-grandson of Magnus. He joined forces with Flurgen, Marat, Yarkov, and Zanussi in the plot to smuggle cocaine distilled into whiskey into countries across Europe and Russia, and then the whole world. He contributed the meeting place, as well as it's distillery, and the distilling process. He managed to mortally wound the Clansman when he was distracted with his father but was killed by the Clansman before he fell. A Russian, Moscow Eddie joined forces with Flurgen, Marat, Strathcoe, and Zanussi in the plot to smuggle cocaine distilled into whiskey into countries across Europe and Russia, and then the whole world. He was shot by the Punisher, and then his cigar caused an explosion that killed Zanussi. An American, he was one of the top three players in the New York cocaine game, having strong connections with the Medellin Cartel. He joined forces with Flurgen, Marat, Strathcoe, and Yarkov in the plot to smuggle cocaine distilled into whiskey into countries across Europe and Russia, and then the whole world. 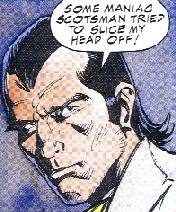 He was nearly killed by the Clansman shortly after arriving in Edinburgh, but the Punisher saved him so that he could learn his plans and catch his allies as well. At Castle Strathcoe, Zanussi was killed when the Punisher killed Yarkov and his burning cigar caused the whiskey vapors to explode. Ivan was Moscow Eddie's bodyguard/assistant. He held the Punisher under the cocaine-tainted whiskey, nearly killing him. When the Punisher recovered and returned, Ivan attacked him again. He had Castle at the disadvantage, until they got too close to a fireplace and Castle shoved a burning log in his face, knocked him back with the poker, and poured some of the same whiskey down his throat, killing him. image: page 4 or 9 of story.